Yeah, I’ll be buying Pokémon Mystery Dungeon 2 (probably Explorers of Darkness) when it comes out this week. Unfortunately, I won’t be playing it until I finish Pokémon Diamond, one of the previous games in the series. At least that’s what I’ve been telling myself. I really, really like Diamond, but as usual with the “main games” in the series, I get obsessed with minutiae like planting seeds to accumulate berries, getting “Japanese” pokémon online for the kanji, and basically “catching them all” which distracts me from finishing the actual quest.If anyone has a decent Gible (preferably Japanese) and wants to trade, I’ve got a cute Pachirisu looking for a nice home. The last few sentences of your blog are like you are speaking another language. I have no idea what that means. Very funny strip, though 🙂 I love Mike’s static expression. Is it bad if I understand every word? Very Funny, Jefbot! Wonderful colors, priceless expressions, and just so true to life. Since I’ve spent over a decade dressing up as Pikachu for children’s birthday parties, I CANNOT stand Pokemon! But I do love this webcomic! Keep em comin, bot. Way to go with the two strips a week, too! YOU LOOK KRAZY! i want to hit michael cornacchia in the head too!!!! it sounds just like michael, why isn’t his head bleeding? perhaps, you should have hit him harder. I love that you get me excited about things I HATE!!! It’s so funny!!! Great job Jefbot!!! This is so funny. I love that Jefbot lives at the “magical roundabout” that joins reality with videogames, pop culture, politics, tv, movies, acting, brains, wit, friends, family, realms yet-to- be-imagined and, most importantly, Jefbot. john, heheh. yeah, sometimes i get carried away or am just too lazy to filter the geekspeak. michael cornacchia, thanks, dude. sorry about your bad pikachu experiences. #2 jefbot fan, don’t hit him. please don’t hit him. unfavorite, i had no idea this strip would provoke all these violent tendencies toward michael. funnyshaffer, thanks, shaf. hopefully your excitement will grow into love. anonymous, i am something (and someone) completely different than my comic persona. he’s way cooler. natalie, glad you liked it! and tell your friend that soda coming out the nose is the greatest compliment i can hope to get. did you pick up mystery dungeon 2? time or darkness? Laughed and laughed! Sorry, Michael…sort of a Wiley Coyote moment…? Remember when we were doing a scene in Dee’s class and you were saying something about Picachu and I had absolutely no idea what you were talking about? Ahhh… good times…. MY KIDS ARE POKEMON FREAKS. MAYBE YOU CAN GIVE THEM SOME POINTERS ON THE GAME. MAYBE YOU CAN COME OVER AND PLAY IT ON THE WII W/ THEM. OMG! Hilarious! I <3 Pokemon! god yesterday i was gonna put three whole paragraphs on how much i hate the new pokemon on here, but i slept on it and decided not to. 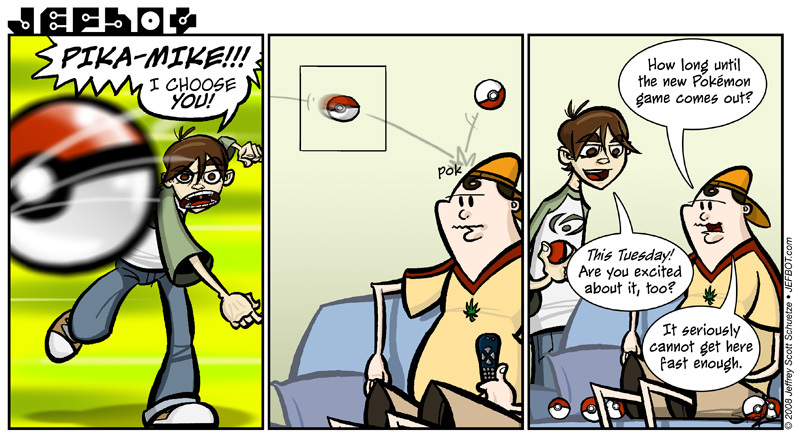 “Pok” eh? I always wondered what sound a PokeBall made when it hit someone in the head…I guess I don’t have to test it out myself now. 😛 Nice Webcomic! I’m the complete opposite. Once I’ve completed the main objective THEN I go out and “cath’em all”, compete in contests, and plant berries religiously.